The Great Dane dates back to the 14th century, when it was used a boar hunter and bull baiter. This powerful dog was developed primarily in England and Germany by cross breeding the Greyhound with the English Mastiff. In the 17th century, they become very sought after and were being bred in large numbers. Many of Germany’s affluent would take the tallest, most intimidating dogs and keep them at their estates. They have been hugely popular in Germany ever since and became their official national dog in 1876. The Great Dane is one of the largest breeds in the world. It has a short smooth coat that can be seen in a variety of colours including fawn, blue, black, brindle and harlequin (merle). They have an affectionate, pleasant nature and are good with children. However, exercise caution around toddlers as due to their size they may knock them over. Also, early socialisation and consistent, confident training is paramount to avoid any behavioural problems. Care is required if you intend to breed these dogs. If you breed harlequins or merles together, about 25% of the puppies will either be born dead or have serious defects including blindness or deafness. Average lifespan of 7 – 9 years. Osteochondosis dissecans (OCD) – Developmental disorder where flaps of cartilage run against tissue causing irritation, pain, lameness and eventual degenerative joint disease. If severe enough, this can require surgery. Panosteitis – Excessive bone production in long bones of young dogs resulting in shifting lameness. Addisions’s Disease – Underactive adrenal glands causing life threatening electrolyte imbalances and kidney disease. Wobbler’s Syndrome – Pressure to the spinal cord in the area of the dog’s neck causing a range of signs from altered gait to paralysis. 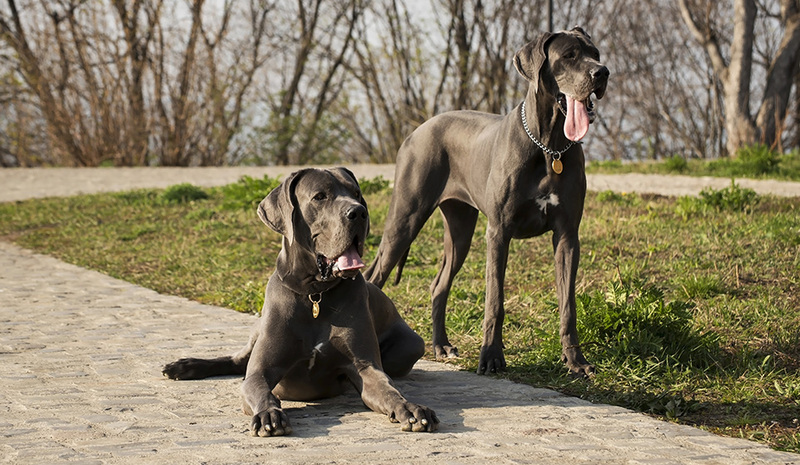 Looking for Great Dane insurance?